Thank you for contacting Delta Roofing , a representative will contact you shortly. For more than 40 years, Carlisle SynTec has been a leading manufacturer of low slope roofing products. With over 10 billion square feet of roofing materials sold, Carlisle continues to lead the roofing industry by providing its valued customers with the most innovative products, services and warranties on the market. With their full line of Sure-Seal EPDM, Sure-Flex PVC and Sure-Weld TPO roof systems, Carlisle has an option for any design application. All Carlisle roof systems offer time and labor saving features, such as Factory-Applied Tape (FAT) and heat-weldable seams, providing building owners with the strongest, most cost effective roof available. Carlisle also offers a number of highly reflective, energy efficient roofing systems that can drastically reduce a buildings energy costs. Their classic EPDM and TPO membranes can be covered with Carlisles Roof Garden products, helping to control storm water runoff and reducing the heat island effect. All Carlisle roof systems offer superior wind and hail protection and come standard with the industrys best warranties, some as long as 30 years. At their state-of-the-art training facility, Carlisle trains and updates their more than 1,900 authorized applicators, ensuring every Carlisle roof is installed properly and efficiently. EPDM single-ply membranes have been the commercial roofing industrys material of choice for nearly half a century, and Carlisle has been defining the standard since the beginning. Today, Carlisle SynTec offers the most high-performance, energy-efficient, sustainable and innovative line of EPDM membranes and accessories on the market. From Factory-Applied Tape (FAT) for stronger, more dependable seams to the industrys only ENERGY-STAR-qualified EPDM membrane, no one offers the versatility and performance like Carlisle. So when you need a sustainable, long-lasting rooftop, look no further than the single-ply membrane with nearly a half-century track record of performance and durability...Carlisle EPDM. Carlisle's Solvent-Free EPDM Bonding Adhesive is a one-sided wet lay-in adhesive that requires no mixing, is odor and solvent-free, and meets increasingly stringent VOC requirements. High-performance roof features Sure-White EPDM FleeceBACK membrane over flute fill polyiso insulation and 1/2-inch high-density SecurShield HD cover board, all set in Flexible FAST Adhesive. Thermoplastic polyolefin (TPO) is the fastest-growing segment of the commercial roofing industry, and Carlisle is the leading supplier of this type of roofing material. Carlisles white and tan Sure-Weld TPO membranes are ENERGY STAR-qualified and Cool Roof Rating Council (CRRC)-certified, and have been directly attributed to a reduction in energy use and cooling costs for buildings in warm, southern climates. Time-Lapse comparison of a Sure-Weld SAT TPO system versus a traditional fully adhered roofing system installation. Carlisle's FleeceBACK is the ideal choice for buildings that require superior rooftop protection and long-term durability. FleeceBACK roof systems exhibit superior puncture resistance and feature up to 75% fewer seams than modified bitumen roofing systems. A unique video case study highlighting the recent installation of Carlisle's premium 145-mil FleeceBACK EPDM membrane on the Indoor Track and Tennis facility at Smith College in Massachusetts. The latest news and updates from Carlisle-TV. The latest need to know information from CCS News, featuring Flexible FAST adhesive. Polyvinyl chloride (PVC) is a trusted membrane that has been providing decades of waterproofing protection in Europe and North America. PVCs popularity stems from its dependable, heat-welded seams, high reflectivity, superior physical attributes and resistance to water, chemicals, grease, fire and punctures. Carlisles Sure-Flex PVC feature ENERGY STAR qualification, contribute to LEED credit requirements and are CRRC-rated and Title 24 compliant. The Sure-Flex product line is one of the broadest in the industry, offering a PVC membrane for virtually any low-slope roofing specification. From 10-foot-wide sheets and fiberglass reinforcement to FleeceBACK and Elvaloy enhancements, Carlisle has a PVC membrane that will suit your needs. 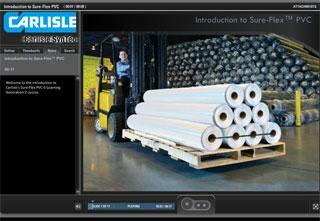 Explore the new world of Sure-Flex PVC with this introductory marketing learning module. Learn of the different configurations available and the marketing strategy behind Carlisles newest membrane addition. Carlisle manufactures an extensive variety of insulation products that provide increased thermal performance and energy efficiency, including polyisocyanurate insulation and block-molded expanded polystyrene (EPS). These products can be used across the entire building envelope from the foundation to the roof and everywhere in between. This video profiles an installation of Carlisle's Sure-White EPDM, the only ENERGY STAR-qualified EPDM membrane in the roofing industry. The roof was installed by authorized Carlisle contractor. See how Carlisle SynTec's Roof$ense lifecycle analysis program helped one rep and contractor sell more insulation, while saving their customer thousands of dollars in future energy costs. Promotional video for SecurShield HD.